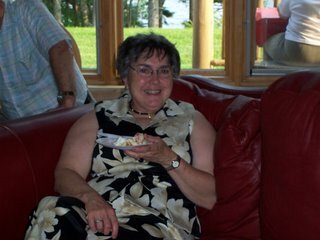 Yesterday was my Aunt Zelma's 60th Birthday.We celebrated by having a gathering at the lake. It was a gorgeous day. I saw many relatives and community people that I had not seen since last year. We had BBQ and potluck. And, of course, birthday cake. Over the years, Aunt Zelma has been a terrific aunt. She never forgot a birthday. She has always been so cheerful and interested in our lives. She is a doll. I gave her a scrapbook which I plan to add pictures of the party for her. So nice to be home for this special party. I think 60 is the new 50!